Three goals and three points for NYCFC on Wednesday as they snap the Montreal Impact's four-game win streak. New York City FC: Johnson; Sweat, Callens, Ibeagha, Tinnerholm; Ofori, Ring (Awuah, min. 81), Moralez; Wallace (Matarrita, min. 62), Medina, McNamara (Lewis, min. 67). Montreal Impact: Bush; Raitala, Cabrera, Fanni, Petrasso; Taïder, Piette (Krolicki, min. 82), Shome; Piatti, Jackson-Hamel (Silva, min. 59), Edwards (Lovitz, min. 59). SCORE: 1-0, min. 60, Medina. 2-0, min. 65, Matarrita. 3-0, min. 76, Lewis. 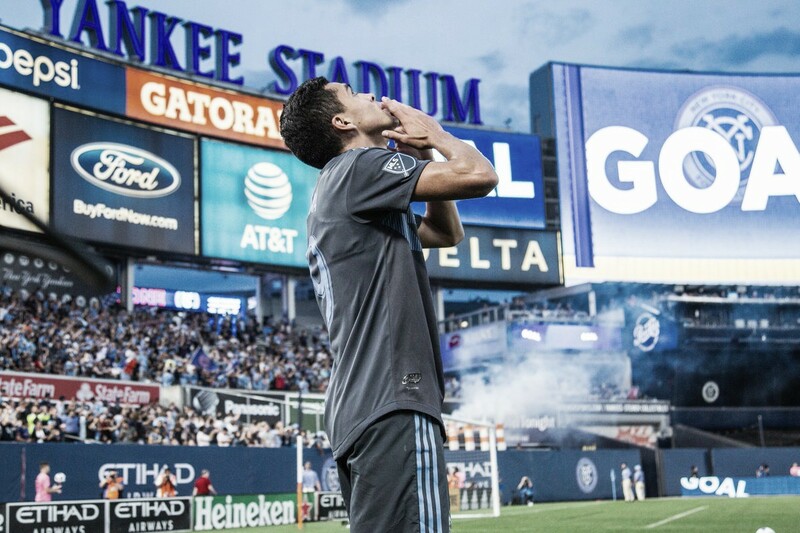 On Wednesday, New York City FC hosted the Montreal Impact at Yankee Stadium for a midweek MLS clash. The Boys in Blue were without both Jo Inge Berget and David Villa, the two men who most naturally fit in as a striker. Also forced to miss the match through injury is Ismael Tajouri-Shradi, who has scored the joint-most goals alongside David Villa for NYCFC in 2018. The game started slow, as many of these midweek matches tend to do, but NYCFC were awarded a penalty in the 11th minute. Or were they? After going down in the box following a collision with Evan Bush, Thomas McNamara received a yellow card for simulation. Despite a bit of contact, the ref didn't believe it was enough to award a penalty and the score remained 0-0. Following that, there was some excitement injected into the game, but that was short-lived, and neither side came very close to scoring for the rest of the half. Both teams looked lethargic following a match at the weekend, and fans of both sides, as well as neutrals, were hoping for more excitement in the second forty-five. 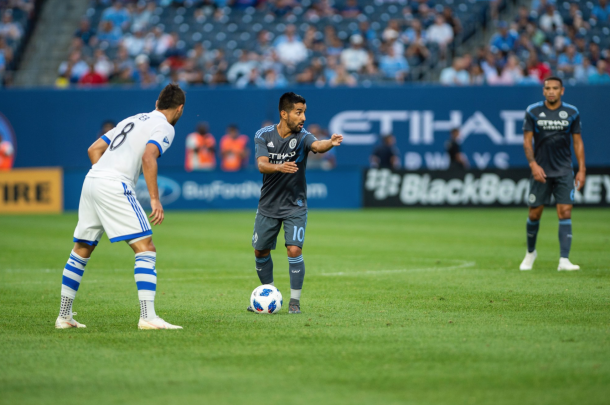 NYCFC came out the better of the two sides early in the second half forcing problems on Montreal's backline. It was Alexander Callens who came closest to breaking the deadlock early in the half as his header banged off the post in the 49th minute. Next, it was Maxi Moralez who forced Bush into a tough save. Ben Sweat played a low ball across the box to an on-running Moralez. The Argentine's shot went straight at Bush who pushed it wide for a corner. The hosts were coming closer and closer to scoring with every attack. Finally, at the hour mark, Jesus Medina blasted a shot into the net after a pair of fake shots beat a couple defenders. It was a well-deserved goal after a moment of brilliance from the Paraguayan. Shots, possession, and now goals are all statistics that NYCFC had the better of at this point in the game with the former pair being more dominant than the scoreline would have you think. Just a few minutes later, recently introduced Ronald Matarrita doubled the lead for the hosts. When things aren't going your team's way in front of goal, sometimes a moment of brilliance is necessary, and Medina and Matarrita delivered that in quick succession. After Medina's cross found Matarrita, he spotted Bush off his line and dinked it far post into the side netting. The scoreline was finally starting to accurately portray NYCFC's dominance. Three goals was good enough for three points as NYCFC left the stadium the happier of the two teams after an exciting final forty-five. The hosts never looked like conceding and they didn't. An impressively organized Domènec Torrent side deservedly pick up a win without a handful of key players. For the hosts, they'll wrap up their three-game homestand with a matchup vs the Columbus Crew on Saturday. Following that, they'll visit a struggling Orlando City SC side before a flight to the other side of the country, where they'll meet with the Seattle Sounders to wrap up the month of July. As for Montreal, they've got some tough games ahead of them. After Wednesday's meeting with NYCFC, they'll play host the San Jose Earthquakes. Then, a meeting with the Portland Timbers at Providence Park before hosting a match between themselves and Atlanta United.